Family frilled to be at the Australian Reptile Park. 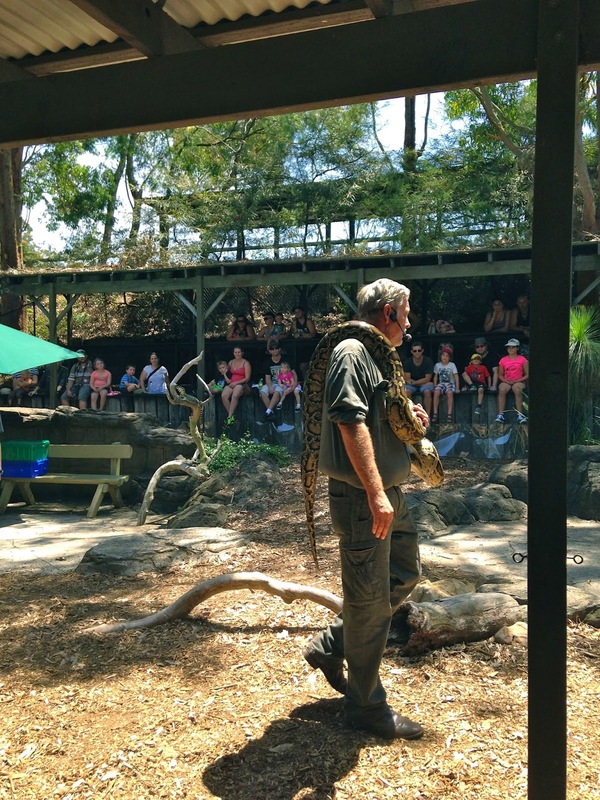 The first stop on our traipse-around the Central Coast, on The Legendary Pacific Coast, was The Australian Reptile Park in Somersby, just one hour’s north from Sydney. What the children learnt at this hands-on zoo today adds layers to what they might have otherwise learned from a textbook and then some, with the exhibits identifying Australia's vulnerable species as well as our most venomous snakes and spiders. While snaking our way around the park increased our understanding of the eight-legged inhabitants of the park, the experience of scurrying around the caves of creepy crawlies saw me outed as an arachnophobe from the get-go. The displays are fun, informative and categorically creepy as they help identify various species of spiders that have apparently infested our house. Despite reading the sign that 'hairy doesn't mean scary' and seeing the safety net of inch-thick glass, my reaction when confronted with tarantulas is one of abject terror. What the children loved most about this den of predatory arachnids was dropping foreign objects into my hair and freaking me out. They also enjoyed learning about the park’s long association with the production of funnel-web spider venoms. If you arrive at 9.45am, you can observe the funnel-webs being milked. Incredibly, since the advent of the anti-venom in 1980 there have been no further deaths attributed to bites from this – the world’s deadliest spider. Go Australian Reptile Park, go. 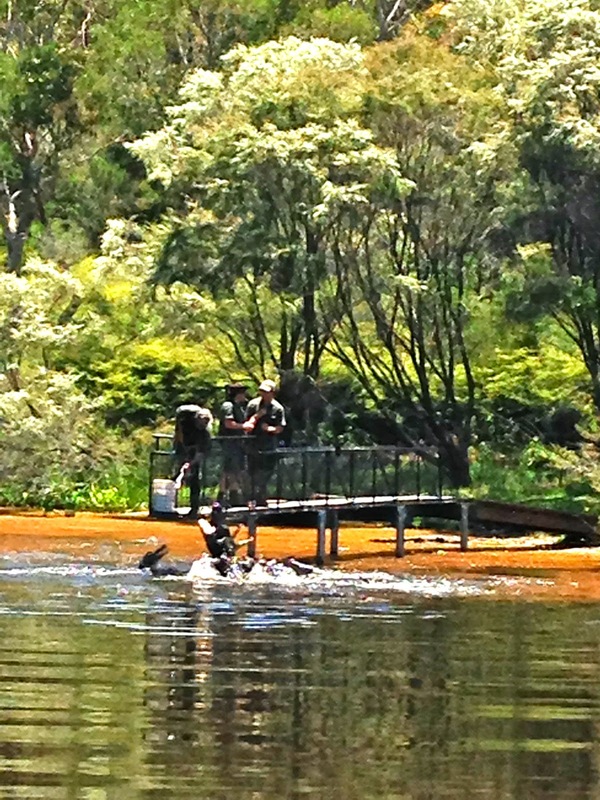 Other highlights of the park included seeing venomous snakes, a legless lizard, learning about the zoo's efforts to save the iconic Tassie devil, having our photos taken with Polly, the koala and watching in awe as the zookeepers feed Elvis, NSW’s largest crocodile and a gang of ‘hangry’ gators. The lagoon becomes a broiling pit of hangry gators at feeding time. After enjoying a welcome picnic of sandwiches and fruit at the Hard Croc Cafe, we motor back out on the highway and head to the Glenworth Valley, which is heaven for outdoor adventurers. Despite being scheduled to go horseriding, the heat flowing down into the valley precludes this an option as the engines of both horses and humans are overheating. According to my phone, it’s 42 degrees in the shade. So the suggestion to go kayaking is the kind of blue-sky thinking that the outdoor adventure centre is renowned for. After patting a few palaminos, we follow our guide James on his quad bike spiralling through a speckled stand of eucalyptus trees until we reach a pretty crook of the Popran Creek. We drag our kayaks down onto the river bank and flop in unison into the mineral-rich water for a swim that can be best described as life-changing, with the creek a delicious mix of rainwater from the mangroves and saltwater from the Hawkesbury. I know it’s not rational, but with the alligator feeding frenzy still front-of-mind, I keep a close eye out for any croc-ologs. What better way to spend a broiling hot day than paddling in a kayak in Popran Creek. The air smells delicious at the Ocean Beach Holiday Park, briny from the sea and fragrant with the blossoms of the flowering gums. Our cabin is clean, comfortable and modern and the park is purpose-built for kids and parents: think jumping pillows, water park, half-size tennis courts and adventure playground. The Central Coast has large pockets of national park and hinterland as well as its stunning coastline. Kiddies' Corner is a safe and sheltered cove at the southern end of Umina Beach. While our boys, aged 10 and 11, affix their faces into the joyful position for the afternoon – doing backflips on the inflatable pillows, racing each other on go-karts and doing potentially illegal bombies in the pool, we then stroll along Umina Beach until we hit the local surf club, where, for the sum of $6 we enjoy a sundowner at the session the locals call ‘Sips’ while the kids splash about in the shorey. The park is protected by Broken Bay at the southern end of the Central Coast and the children have pinky-sweared we will enjoy the 4km return journey again along the talcum-soft sand tomorrow morning. Patonga is a very sedate and picturesque fishing village on the Central Coast. The Patonga Hotel scored a whopping three schooners in Fairfax's Good Pub Guide. We concur: Top pub grub. It's only a short drive to the Patonga Hotel where we pull up a table in the beer garden and observe as a boy and his father walk past with their fishing gear, their faces tanned by the sun; a couple of families arrive with their children dressed in their PJs and a table of touros sit obsessing over the view. We order burgers for the kids, grilled barramundi for the grown-ups and rejoice at just how sedate this setting is, how relaxed and reasonable the staff are and how seductive the overall experience is. While we can see Palmie and the City of Sydney in the distance, it feels like we are a world away. Worth noting is that you can walk to Pearl Beach from Patonga via a fire trail, a picturesque trip that will take about 2 hours. It’s another reason to return to this stretch of coastline, where we stay until the scene has been smudged away with nightfall. 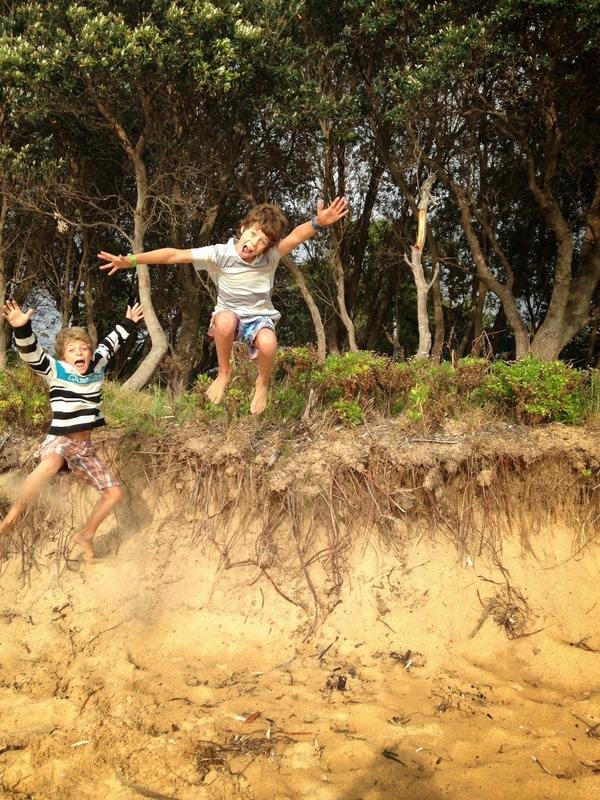 Jumping for joy on our jaunt to the Central Coast.